The Global Trip - The Travel Chronicles of Erik R. Trinidad - Beer Team, Assemble! This blog entry about the events of Tuesday, September 14, 2004 was originally posted on September 18, 2006. DAY 21: On my first night in Athens, I had learned that I wasn’t the only one with the same idea: to throw tomatoes at the Tomatina festival in Valencia, Spain, then travel somewhere for two weeks — in my case, the Greek Islands — and then head over to Munich, Germany for the ultimate beer festival, Oktoberfest. Not surprisingly, most of these like-minded planners were fun lovin’ Australians — so many that I came to believe that I’d seen nothing but Aussies in Munich. A young backpacking German couple from Hamburg that I’d met that first night in Athens concurred, telling me that Oktoberfest was a big annual festival for tourists and no Germans actually ever go there — sort of like how hardly any New Yorkers go to Times Square on New Year’s Eve. I figured that people would travel from afar to celebrate in Oktoberfest — I mean, who wouldn’t? — and like Tomatina, they’d come in groups of non-competitive teams with matching outfits. My suspicions were confirmed when I landed in Munich’s Strauss airport and immediately saw another Team Canada at the baggage claim: a group of guys in matching red hockey jerseys, with a logo on each — half maple leaf, half beer stein. Inspired, I picked up my bag and ventured off to gather some guys for my own team. TERENCE (A.K.A. T, WHEAT) WAS WAITING for me at the officially-labeled “Meeting Point” at the Munchen Airport Center, having just landed half an hour before me after a two-leg journey from New York. Our rendezvous a little after eleven in the morning was anti-climactic and casual — just the way we wanted, as to be a couple of wannabe jetsetters nonchalantly bumping into each other at random. Fans of The Global Trip 2004 Blog might remember Terence from my time in Rio de Janeiro. He, my brother and a guy named Paul had met me for Carnival in 2004, attending the Sambadrome festivities, the street samba parades, soccer games, and hang-gliding/paragliding. A childhood friend for over a quarter of a century, Terence was always up for a good time — and a good beer. What inebriated adventures we’d share in the next couple of days were not yet known to us at the time, but we knew it would be added to our repertoire of great memories. “Paul!” we called out to another familiar face. It was not Paul from Rio, but Paul from Miami, the brother of Jack, my host in Spain for the first leg of this “Tomatoes, Grease & Beer” trip. “Wilkommen,” I greeted Paul to Munich — and his first appearance on The Global Trip blog. He did a shot of Greek raki. IT TOOK US a good ten minutes to figure out how to get a train ticket to the city center. Eventually we got on the extremely clean, extremely efficient S-Bahn train, first riding through farmlands and small residential suburban communities where Munchners lived their lives in quiet areas. “These are all the Germans we’re going to see,” Terence said, knowing how much of a tourist spectacle Oktoberfest was. breakfast buffet, and free wireless internet. 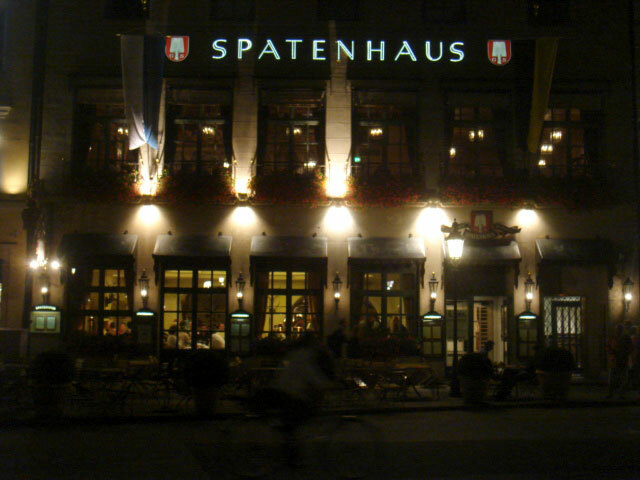 It was conveniently-located within walking distance of the historic center all the Oktoberfest festivities, all in the central neighborhood of the Hauptbahnhof (central train station) filled with two things: strip clubs and computer game stores. “We’re right across the street from the table dance club and a [Playstation store,]” Terence pointed out. “This is my Xanadu!” Not that we had traveled from far away for stuff available at home — during Oktoberfest, it’s all about the beer — although I will say that we spent much of the afternoon bumming around like we were home, while waiting for another person to arrive — it was the quiet before the storm, if you will. We had much-needed jet-lag naps, drank Greek raki and Citron, and watched German-dubbed American TV shows like The Cosby Show and Tom and Jerry. (How do they suddenly talk in German, when they don’t in English?) More appropriately, we watched a bootleg copy of Beerfest on DVD to set the mood, a movie about an underground beer Olympics of team drinking games during Oktoberfest. Things picked up around six when the fourth member of our beer team arrived: Jack on a flight from Barcelona. If you recall, he’d decided to relocate back to the States after trying to establish a career in Spain — but wasn’t about to leave Europe without one last hurrah. His girlfriend Sylvina opted to sit this one out and visit a friend in Galicia instead, leaving Jack to be a guy’s guy with us for three days. The fifth and final member of our beer team was not American nor Australian, but an actual German: my cousin Hans-Georg, who had an apartment in Munich for his job. I hadn’t seen Hans-Georg since his appearance on the big Global Trip 2004 blog, when I stayed with his family in Luxembourg. He would serve not only as a fellow drinking teammate, but our local connection, our inside man. He hadn’t wasted any time in meeting us, coming right from the office on his motor scooter. “How about the Hofbrauhaus?” Hans-Georg said, smirking as if to state the obvious answer. IN LESS THAN TEN MINUTES, we were at Karlsplatz, the area near the historic center and not surprisingly the one most visited by foreigners. “The Scots are here,” I said, pointing out a Scottish team walking around in kilts. “There are maybe fifty percent Germans here,” Hans-Georg said, looking around. We walked around and did a quick sightseeing tour — City Hall, the Theatinerkirsch church, and the opera house — noticing along the way other international “teams” wandering on the eve of Oktoberfest: Brits, Japanese, and even the hockey-wearing Team Canada I’d seen at the airport. Not surprisingly, we saw many Australians, many of them on the huge line waiting outside and trying to get inside the famed Hofbrauhaus — some chanting their national slogan, “Aussie, Aussie, Aussie! Oi! Oi! Oi!” The big crowd was due to Hofbrauhaus’ famous brand name, like a great tourist attraction — suitably, it’s located across the street from the Hard Rock Cafe. Hans told me the Hofbrauhaus was such a touristic thing, some of the barmaids were Japanese to serve the influx of Japanese tourists and in fact, that most of the surrounding buildings, as German-looking as they were, were actually owned by the Japanese. The long line to get into Hofbrauhaus was barely a deterrent to getting good beer, for in Munich you’re never far away from another beer hall. There are several major breweries in Bavaria, each of them setting up various locations in Munich to tap their kegs. From my understanding, Hofbrauhaus isn’t the best of them anyway, just the most popular — sort of how Budweiser in the USA is huge, although from my experience, no one actually drinks it. Walking around downtown Munich, any beer connoisseur would be in heaven; the names of arguably the world’s top beers are found atop buildings in big letters and in neon lights, like monuments of heroes, all as important (if not more) than the historical buildings: Spaten (picture above), Lowenbrau, Hacker-Pschorr, and Augustiner to name a few — the last, Augustiner, being what many locals consider to be the best brewery Bavaria has to offer. We ended up at a restaurant of another favorite, Paulaner, sharing a big table with six Italians — three couples of old, middle-age men and younger wives. We drank Hefe-weissen dunkels (dark wheat beers) while looking at the menu. “So do they have wurst [sausage] here?” I asked my cousin. “I will show you the authentic food.” Fifteen minutes later, platters of roast suckling pig in dunkelbier gravy arrived with potato dumplings and sides of fresh cole slaw (all at regular non-inflated-Oktoberfest prices). Across the way, the Italians were eating roasted duck — although Jack used pizza as a way to break the ice with them, asking them about a big giant pizza festival he’d seen on TV, somewhere in Italy. The young, Marisa-Tomei-looking one he sat next to had no idea what he was talking about. That was just one on-going joke of the weekend that was spawned by our first team dinner together. Another Italian-inspired one was a routine, done in a falsetto, frantic Italian accent: “I come to Munich, to Oktoberfest, and I want to cheat on my husband, and I meet a nice guy, an Americano, and I want to show him my Naples, and I tell him it’s only two hours on a train from Roma, to the norte… but you wanna know what he wanna talk about?! He wanna talk about a grande pizza in a piazza… no capisce!” Every time we’d say it, Jack would just give us the finger — but it was all a part of good-natured beer team drinking camaraderie. WITH OUR FULL of Italians but not beer, we wandered looking for more. “I know a place we can go,” Hans-Georg told us. “This is great,” Jack told me. “I love having a local connection.” We walked off the tourist radar, while I filled Jack in on the funny meeting I had with my cousin, how Hans-Georg showed up at my door one day in the 80s out of the blue claming to be my cousin — all while I was watching the pilot of Perfect Strangers when Balki did that to his cousin Larry. Anyway, we went to Schrannenhalle, a shopping, dining and entertainment complex recently converted from an old market place, complete with Der Pschorr, an indoor beer garden. Performing on a stage in front of us was a live jazz band, playing for the almost all local clientele. “So this is where the locals come to get away from the Australians,” I said. We drank until the end of the set and then dropped Hans-Georg off at his motor scooter before he got too drunk. The rest of us went out for more beer and ended up at another small beer hall in the basement of an unassuming storefront a block from our hotel, amidst all the neon lights of strip clubs. “Now this is what I want to see when I come into a basement!” Jack proclaimed. We had some more rounds of beers — I forget the total count of the night — but ended the night off there. It was a relatively low-key evening before the real beer drinking began the next day, when Oktoberfest officially kicked off. My beer team was assembled, warmed up, and ready to go. MORE TO COME in the next 24 hours. STAY TUNED! I must have missed this…why is the word unlimited always underlined? here in the states with some fine German beverages?? ?and a team of my own. Are you back in the states now? Trying to let your liver recover? In honor of Int’l Talk Like a Pirate Day - Ahoy matey! because of less preservatives and stuff in it - or is that a myth? Probably a myth, I’ve had hangovers in Europe before. dance club would just merge into one..
perhaps figure out where to head! Thanks for doing what you have done! chronological order since the file number orders differed by camera. I don’t see any more pictures, am I looking in the wrong spot? culturita alcholica y de joda la adoptaron en Uruguay. How timely… just saw the film “Beerfest” last week.